Stan Sakai is clearly at the top of his game. Even though from the very first volume he proved to be an enthralling storyteller his craft has now been honed like the blade of the finest katana. These stories focus more on emotion than drama and offer us a selection of feelings that all of us have probably experienced in our lives. This is a thoughtful, reflective volume that shows us not only what it means to be a samurai but to be a human being. Few writers would have the skill, or courage, to attempt such a task. 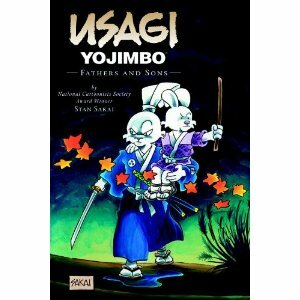 This volume typified how rich and complete the world of Usagi is. A story can feel like a linear conveyer belt of trials and tribulations: Usagi is like a jigsaw of a beautiful landscape. With each new volume we get to add a few more pieces to an epic vista. We know roughly what the overall picture is but it is only by piecing together the little details that were hinted at long ago do we uncover the rich splendour of this unique world. This is not just the adventures of a single rabbit but the history of fascinating time, place and people. The theme of this work is fathers and sons as Usagi wrestles with the choice of whether to tell Jotaro the truth of his heritage. The Lone Goat and Kid also make another appearance as do some new fathers and their sons. Other, non-paternal, stories are told too including an excellent but tragic recollection from Usagi’s Sensei Katsuichi. All of these are themes that we can personally identify with so this volume has a real impact for the reader. The art is excellent as always. It is very hard to write much about Sakai’s art. It is so perfectly appropriate that it becomes invisible. The advantage of having the writer and artist as the same person is clearly evident as the two never come into conflict. They are perfectly balanced. Sometimes more words are needed so the art will fall silent. Sometimes we must see things for ourselves so the words will subdue. It is clearly a liberating method to have absolute control over both tools when creating and expressing your story. The two are perfectly balanced and never come into conflict. The writer and artist have no need to compete or show off. They are the Yin and Yang on the page. This isn’t the most dramatic, shocking or enthralling volume but it feels the most personal, and the most moving, and that is why it deserves a Double Thumbs Up! This entry was posted in Graphic Novel and tagged DOUBLE Thumbs Up! !, Stan Sakai by 365gn. Bookmark the permalink.